Received my repaired bolt sooner than expected and repaired better than new. Thank you again and I'm sure we will do business again. 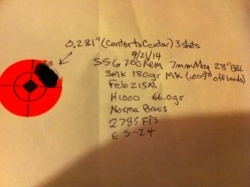 Dan L.
I recently had an issue with a M700 Remington. I contacted Nathan who explained what my problem was and invited me to stop by and he would fix my gun while I waited! Needless to say, I jumped at the chance. Nathan had my gun fixed in about an hour. I couldn't be more pleased with the service at Straight Shot Gunsmithing. Thanks Nathan and Elizabeth! I needed my bolt handle reattached to my bolt. After not having any luck with TWO local gunsmiths, I sent it to SSG to have it Tig welded. The weld looks perfect and the bolt performs flawless. Had a very quick turnaround also. Thank you Nathan and Elizabeth. I will be returning. Hello Nathan. I just received my 300 WSM and let me tell you that i have not been this exited since i was 9 years old at Christmas. the rifle is absolutely awesome as also are you your fit and finish is impeccable. 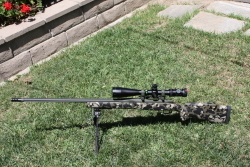 I am also very pleased in the cerakote and camo job done by custom gun coatings. i just finished mounting the vortex scope and atlas bi pod it looks great i want to sincerely thank you for your beautiful work and time spent talking to me as this is my first custom build and i hope to do more with you of course. God bless you and your family. Hi Nate , Ben S. checking in from Arizona. I bought a TBAS from you about a year or so ago and it has been probably one of the best investments I've made. The time savings and machining quality it's provided me have been outstanding! I can't say enough about the rifles Nate builds. 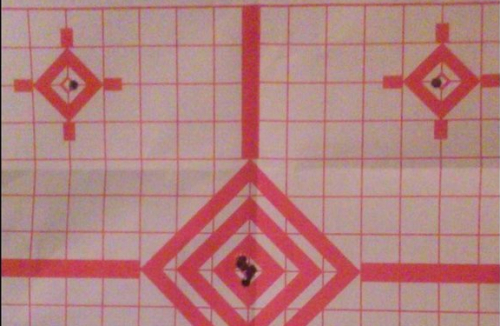 This was a 1000 yard group I shot with the 240 Weatherby I had Nate build for my coyote gun. I'm thinkin them coyotes are in trouble. When shooting rifles Nate has built you come to expect groups like this. This group was from a 7 Dakota but Nate has also built me a 240 and 300 weatherby that shoot the same. Thanks again. I've had Nate build me a few guns. This deer was shot at 560 yards out of his bed with the 7 Dakota. The guns Nate has built for me shoot crazy accurate and give you the confidence the bullet will hit exactly where you want it. 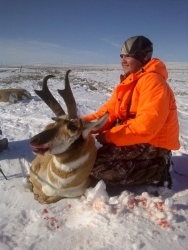 (WY deer - tag goes with the meat) Thanks Nate. Hey Nate. The 7 WSM you built puts 3 into 6 inches at 1000. Shot my buck at 505 this year. After baking on color and turning on threads, I put the can on and she still shoots nice and true. 243, 250+ yds, flippin dogs all day long! Had threads put on and flutes colored to match trigger. Looks great! Nathan, thank you!!!! The Rem 7 mm Mag is awesome. 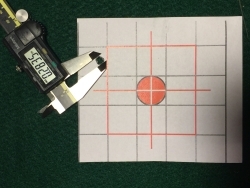 This 3 shot group shows how the quality of your work can result in extremely accurate rifles. Just outstanding sir!!! Thank you so very much. Thanks again Nate for your superb work, the 30/375 S.I. 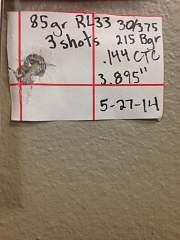 you built me is the most accurate gun I own and will consistently put three shots at 1/4 MOA or better but this is my best group to date with it at 100 yards. Any future work will be going to you! P.S. Your muzzle brake works amazing, this rifle has less recoil than my 25-06. Nate, thanks again for the awesome rifle. Your attention to detail is incredible. First kill with the 243, coyote at 453 yards. Thanks Nate for your superb work, because of it, My brother and I have been able to take some great trophies this season. A whitetail doe at 560 yards, a 3x4 Mule Deer buck at 520 yards, a 75" antelope buck at 330 yards, and a 5x5 bull elk at 245 yards. Hello Nate , thank You for designing a brake what actually works.Your 1" V brake is the third brake what I tested on my 338 RUM.The first was ok, I only got a cut from the scope once, the second nocked the ear protection off of5 my head every time I fired my rifle but after I installed your brake the recoil on the 338 RUM changed to a little more than a 243. 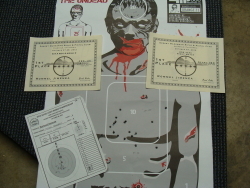 Now I love to shoot my rifle and I did about 40 rounds of the bag the other day with a big smile on my face. Three of my rifle has your brake already and I am telling to everybody to contact You if they need one .Thanks again ! After two years of competing at our local F-Class matches, I finally won one using Nate's Rifle.